First impressions are key, and it’s always special receiving a beautifully written envelope through your letterbox giving a hint of what’s in store for the rest of the celebration. Traditionally, calligraphy has been mainly used for invitations, but now it is incorporated into many ‘on the day’ aspects at weddings and parties. 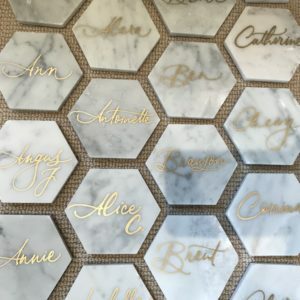 Our recent favourites include marble coaster place names at a wedding at the V&A gallery in London, or personalised fans for favours at a beach party in St Tropez. While it may be an ancient art form, the styles to choose from have rapidly increased with the popularity of a wide range of new scripts pairing the classic techniques with modern, casual, personality-filled styles. The consistency and precision of Italic hand and Copperplate can bring a more formal look to an event. Italic hand is elegant without being fussy, and you can’t go wrong choosing this classic, timeless script. The simplicity makes this style very versatile – we have found this script works equally well for personalising traditional wedding invitation suites to writing names on slate placemats at a Woodland Themed Bar Mitzvah. Modern styles embrace imperfections and can add unique character to your event. They are flowy in nature, with flourishes that have a fun, bouncy vibe. This was perfect for playful placement cards we made for a 50th birthday party last year. 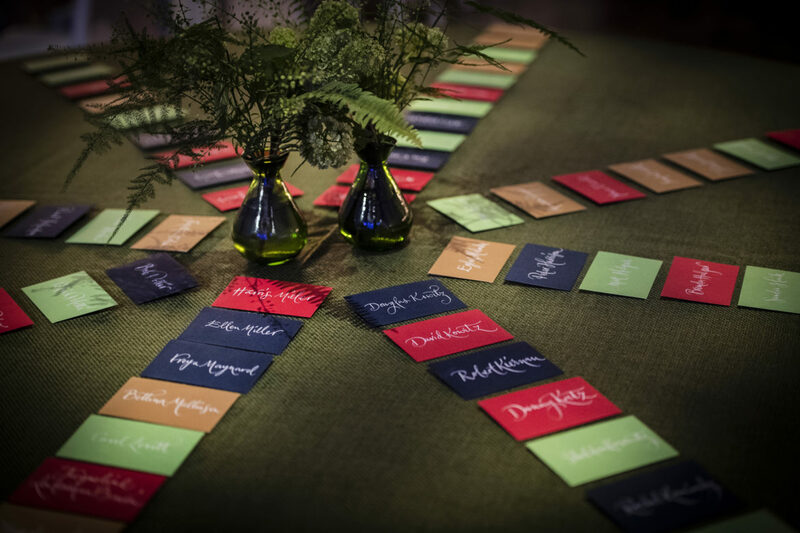 At a recent dinner held in a warehouse, the contemporary calligraphy really enhanced the décor and theming, which was all based on one piece of artwork chosen from the client’s favourite artist. 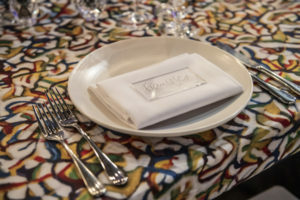 Guests found their table in the colourful envelopes displayed on the placement table, and clear acrylic cards with their names on were at each place setting. There are so many modern calligraphers who each have perfected their own individual lettering style. 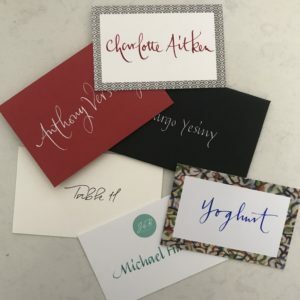 A good place to start when searching for a calligrapher that suits your personal taste is by looking through Pinterest and Instagram, which are full of great photographs of calligraphy and chic ways of including it in your event. It’s the small details that often make the biggest impact, and handwritten calligraphy is a great way to add a personal touch. From the moment a guest receives their invitation, carried through to the details on the day, handwritten calligraphy is definitely a way to impress your guests.